Signature Plastics DSA family: "medium profile, spherical top and non-sculptured"
This is gorgeous. I'm a little confused as to why the novelties have a teal function row instead of charcoal when there's too much width variation in a typical function row to make one kit fit, but it's too pretty for me to care. Purchased. You can put these anywhere you want... not necessarily the bottom row. TKL is the most popular form factor, that's why we went with six keys (plus the yellow '2nd'). I think someone suggested it during the IC. It's not unsual to offer 1u and 1.25u novelties, I believe. Group buy is currently open! NB. Our European and Asia proxies will be up in the coming days. GB launch is scheduled for next week! We are still discussing pricing with our vendor, TKC, as we got the latest quote only yesterday-- though we have a pretty good idea. We've updated the kits. Some were combined: TKL + Specialty, Ortho + 40%. This decreases the price considerably for those who need the Specialty kit (65%, 75%, 96-key, 1800, HHKB, WKL and so on). Same for 40%. Most importantly, it increases our chance of hitting MOQ on these kits. In for alphas, ortho, novelties and Colevrak, depending on the price. Hey question for you guys! forgive me I’m relatively new to Massdrop and totally new to keyboards. So this drop is for just the caps. I freaking love the little orange edged one at the top. Does anyone know what base it is. How/where I can achieve that exact look? Updated renders to reflect imminent kit changes-- keys mostly stay the same, just rearranged. Along with barred down-arrow, Ducky Pocket support is back! Still waiting! My vortex vibe is waiting for a new outfit! :-) Cool renders and thanks for putting In the effort to keep us all up-to-date with progress! Dude. I'm so stoked about this keyset. It's hot fire. Little late to the party, but any update @voodoo6k? Seems like any day now? Not too late. 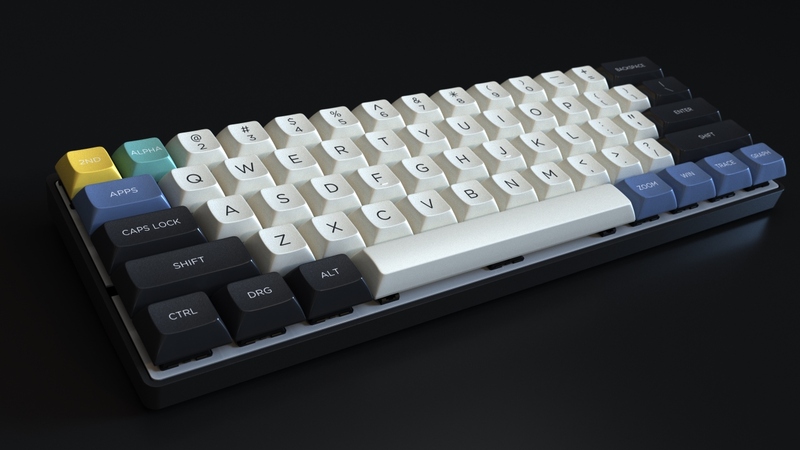 Our vendor TKC experienced some small delays on their last GB, so we're aiming for after their current GB (GMK SKIIdata), so an April launch. We're also making some minor last minute changes to some kits. We'll keep you posted! Would love to see an ergodox set! I honestly remember having one of these lads in grade 8. Now i'm in grade 9. This keyboard set still brings back some of those nostalgia. The novelties are incredible—especially that ħ keycap! I dream of someday having a nice set of Greek alphas in the vein of your π and φ novelties. Any thoughts of doing something like that down the road? I would also love to see the slate blue variant! That's actually the calculator I grew up with, so it hits closer to home. With things like the failure of GMK Greek Olivetti, I've really been on the lookout for anything Greek-related. The "math" font used in DSA Scientific is the most gorgeous I can think of for these letters! I'd love to stay updated on when/if you ever feel like it's a feasible set to produce. Being a physics student who loves quantum mechanics, I think I could actually find practical use for the ħ key! Or, since you've used green instead of blue/purple for arrows and such, the NUMS key could be blue/purple. It was the initial idea to have a TI-83 kit, but it was postponed with the rest of the high contrast/slate blue options... The colour code for the 'Alpha' key would most likely be VAF, which could kind of clash with the deep teal Pantone. It cannot be slate blue since that is a Pantone as well and not worth it for a single key. We did spice up the raise/lower keys with yellow legends, at least! Official word is April launch, we're doing our best to bring this as soon as possible. Cheers! Will these also be available? Or this be sticking to the Grey / deep teal (TI-30Xa)? Thats perfectly fine! Thank you for organizing this! Im so excited! This set is beautiful and Im super into it! I especially like this considering how much math I've done this term and all the math courses I have left <3 If it was not clear by now, I would love to support this set! Any update on the GB date? That is great. This set looks great. Love it! I had that calculator! Added a new render, featuring the upcoming PrimeKB Prime_E ergo 40%. For fun! Any chance of getting a homing bar on the "Down-Arrow" key? Actually going to be making this change! Norde and Dvorak/Colemak kits added. These will be low MOQ (15 or 25)! Looking at the renders it seems that the big spacebars are convex while the small ones (e.g. 1u and 2u in the otho-kit) are concave. Is it so on purpose? I see. Thanks for clarification! This is an absolutely beautiful design! Could you consider adding right modifiers to the Planck kit to use instead of the arrows? My main priority is keeping these kits affordable. Ideally, there would be many more 1u options and kits overall, but this one's going to be very distilled. Hope you can find something you like!